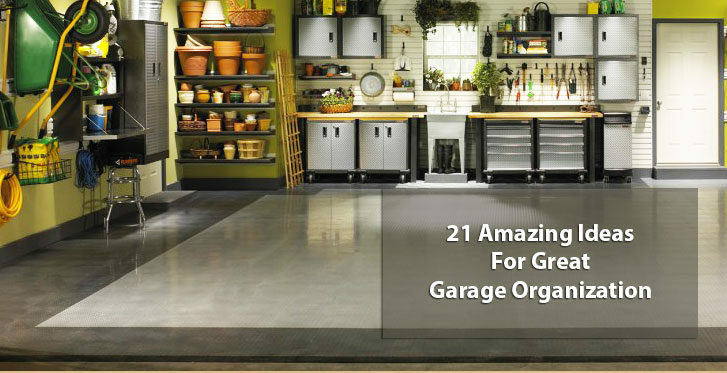 We’ve written about garage organization, basement organization and kitchen decluttering. These areas are usually where our clutter accumulates the most but there’s another one that’s a favourite hiding place for junk; our closets. Like our garages and basements, our closets are typically a dumping ground for things that we don’t have a home for. It’s another way to temporarily cloak our addiction to stuff, especially clothing. Moreover, because clothes are one of the hardest types of items to get rid of, you’re left with bulging closets that require you to wear safety equipment every time you open their door. In today’s market of fast fashion and competitive clothing markets, low quality, high quantity, discounted clothes have paved the way to closets full of clutter. Buried in these closets is the roughly 20% of clothing that most people actually wear. The other 80% of items are never worn because they’re too old, don’t fit or still have tags because they looked good in-store or were a great deal. 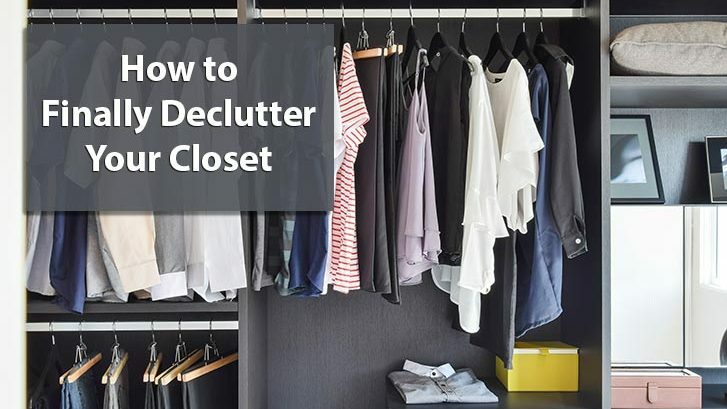 If this sounds familiar and you’re tired of staring at a wall full of clothes thinking you have nothing to wear, it might be time to declutter your closet. 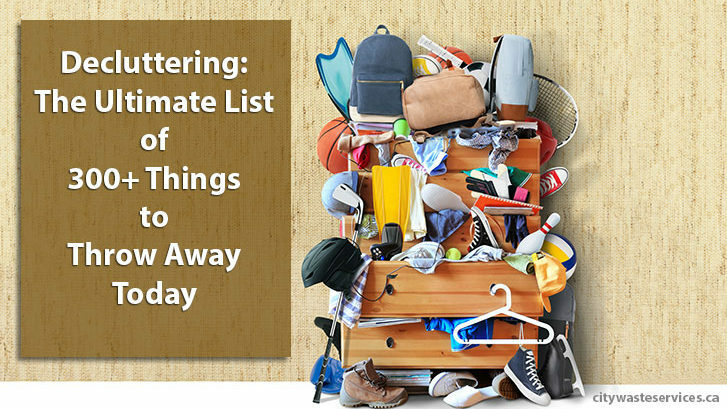 Readers of this blog know that we’re big fans of decluttering and organization, with articles on topics such as organizing your basement and beating back-to-school clutter. Those articles mainly covered the how–with tips and tricks, the when–with timed decluttering sessions, and finally the why–your sanity, of course! It’s understandably challenging to take the first step in decluttering when the mountain of junk in your home is overwhelming. The only way to conquer any mountain, however, is always the same: by taking the first step. So today we’re going to give you the last piece in the puzzle, the what. We’re firing off a list of 300+ things you can throw away so you can take the first step to conquering that mountain today. Howdy folks! How’s the kitchen organization coming along? Last week in part 1 we talked about the first task in organizing your kitchen: decluttering. It’s understandably a massive undertaking for most of us but a necessary one before you even start looking at kitchen storage. To be honest, we ourselves haven’t been able to set aside a big enough block of time to completely declutter our kitchen yet either. The truth is, we haven’t had the chance to ship the kids off to their grandparents. What we have been doing is decluttering for 15 minutes every day–a tip you might know from our article on beating back-to-school clutter. It’s been pretty successful so far and we love how we’re finally able to use a cutting board on the countertop without relocating half the kitchen. Give these timed sessions a try if you find yourselves short on time or babysitters. It’ll allow you to start putting some of these kitchen storage tips to use even if you haven’t completed decluttering yet. Are you finding yourself practicing your Jenga skills every time you’re cleaning up leftovers and need a Tupperware container? Have you opened up your pantry cupboard door in the morning and been knocked square in the nose by the box of Fruit Rollups that was precariously perched on top of your box of cereal? We know you can answer yes to both of these, because we certainly can. Because the kitchen is the most often used room in our homes, it’s usually also the most cluttered and disorganized. Our house is no exception. Every evening, we spend a considerable amount of time cleaning up the kitchen after dinner but every morning, the hurricane of breakfast prep and morning rituals take their toll. You remember when you were young and watched people in sci-fi movies using cool handheld computers? They were from a time in the distant future that could look up anything and have the information immediately right in the palm of their hand. Well, that time is now and those people are us. For us, the main reason this happens is probably because we spend a significant portion of our time clearing tiny weapons of mass destruction off our floors and don’t have enough time to clean the kitchen and the rest of the house. Other reasons are more typical ones, independent of whether there are little people booby trapping your every step. The first is simply having too much stuff in our kitchen, and the second is the lack of good kitchen organization. To tackle the first problem, we know we’re going to have to declutter and get rid of all the stuff that’s collected in our kitchen over the years. 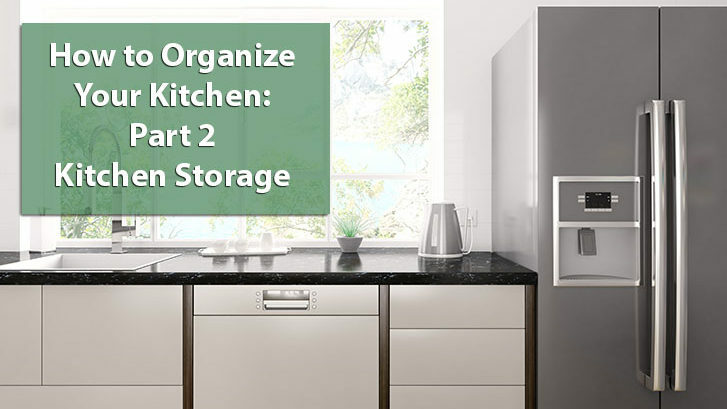 If you’re going to do the same and need some help on how to organize your kitchen, read on. This is part 1 of a 2 part series. Next week we’ll be taking on our second problem: kitchen organization. Did you know that it was National Clean Out Your Garage Day on September 10? We missed it because we didn’t either! If we had known, we would have absolutely, positively spent the day working on garage organization—or at least thought about it anyway. Admittedly, the fact that the day was created by a company specializing in garage organization products (The LeHigh Group) kind of makes you wonder whether it was created just for marketing purposes. However, considering that 25% of people with 2 car garages don’t have room to park cars inside of them (U.S. Department of Energy), it’s likely that The Lehigh Group was on to something. It’s a perfect time to reclaim your garage so your vehicle can be warm and cozy and proud to park there again. Like the basement, your garage usually ends up becoming a dumping ground for all the junk that you can’t find space for anywhere else. Seasonal items like holiday decorations, sporting equipment and boxes full of 2 generations worth of sentimental clutter have probably found their home there, making the thought of garage organization seem worse than a trip to the dentist. With winter around the corner and cooler outdoor temperatures to work in, it’s a perfect time to reclaim your garage so your vehicle can be warm and cozy and proud to park there again. Can you believe it’s September already? The summer’s once again come and gone in the blink of an eye. What’s made it feel even shorter is the amazing weather we’ve had here in Toronto and the GTA. It’s been perfect for barbecues and outdoor activities. Toronto families have been fortunate this summer to have such great weather to spend outdoors. Now that summer’s drawn to a close, it’s time to take a step back. All those exciting summer activities have surely left a trail of garbage and clutter in their wake. Sporting goods as well as park and beach accessories have most likely taken over your car and the entrance areas of your home. You can’t help but cringe every time you walk by with another armful of back-to-school supplies you’ll have to find space for. 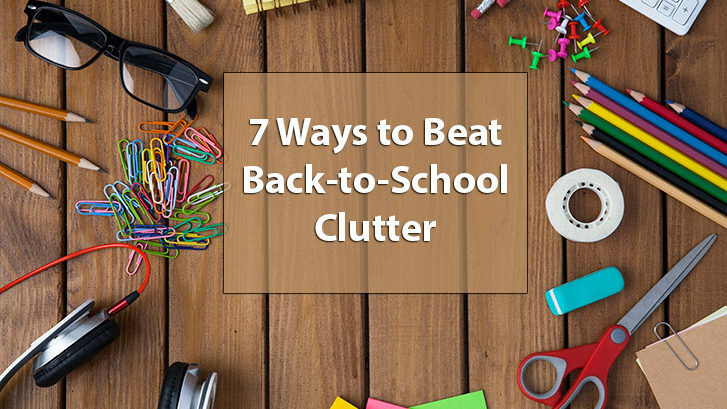 And now that school has started, you know the clutter will only get worse as your kids’ homework and school supplies are brought home day after day. That’s why it’s important to rein in the clutter now before it takes a hold of you and your home over the course of the next year. A 2012 UCLA study confirms what’s pretty obvious to most of us; there’s a link between stress levels and clutter. Similar to knowing the dentist will stop using that horrible high pitched buzzing tool on your teeth after only a few minutes, knowing there’s a limit to your suffering makes it easier. In addition to increased stress levels, researchers in this study tell us that the chaos of clutter restricts our ability to focus. We don’t know about you, but we’ve got enough restrictions on our ability to focus and can’t afford any more. So what can you do about it? Read on for a list of our favourite ways to survive the school year clutter free. Hi everyone! As promised, we’re back with some helpful tips on our favorite subjects: garbage and junk removal! Today were going to look at how junk tends to accumulate in our basements and some simple steps to take for better basement organization. I say secret, but it’s actually anything but one. The basement’s usually where our homeless belongings go for an extended vacation. Most of our basements are dirty, cluttered and in the worst of cases, even breeding grounds for undesirable guests I’d rather not think about, much less write about. Got your attention with the thought of unspeakable critters bunking in your basement? 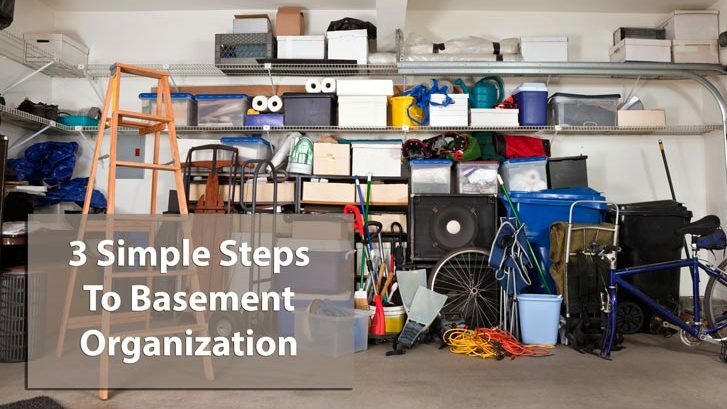 In need of some basement organization ideas? Well, then it’s time to get moving and deal with the war zone you call your basement once and for all!